July 2010 was all about Deuter Backpacks for me at Tahoe Mountain Sports. It was a love-hate relationship really… working on making each of our Deuter products fabulous for your viewing, reading and buying pleasure took a lot of crossed eyes on the computer, opening of zippers, buckling of buckles and sifting through catalogs for mounds of technical info. But through it all, I began to realize how awesome, and versatile, these packs really are. Everyone knows Deuter is famous for the Deuter Kid Comfort Carrier, which was the first child-carrying backpack to be safety certified by an international consumer safety organization (TUV) and is the only one to integrate trekking suspension. 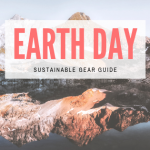 And I’m sure you’ve seen or used Deuter’s hiking and day pack backpacks, but did you know the brand also makes some of the best laptop backpacks around and dozens of bicycle backpacks (like the Race Air Lite), bike accessories and panniers? 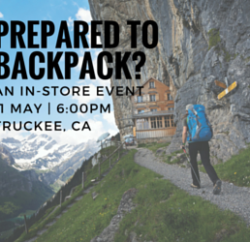 And did you know that we’re one of Deuter’s top selling shops, carrying every item in their current catalog?! 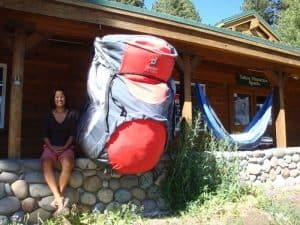 We even have the largest Deuter pack ever made, and use it as a tourist trap on our front porch (ha ha! see photo of rockstar TMS employee Sara for scale above). 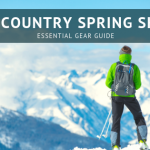 So, in tribute to our fresh Deuter pages, we bring you excerpts of Deuter reviews from far and wide, from our shop’s gear guru, Kevin, to customers from Oregon, Washington and Nevada. 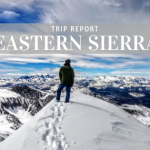 Enjoy — and share your own Deuter reviews on our product pages if you’re a proud Deuter backpacks owner. I bought this backpack to use for a variety of uses. I wanted a hiking daypack and something I could use when I bike to work a couple times a week. This pack is really comfortable and has a ton of cool features, like the integrated rain cover, which is a great value. I really like it because it is a fairly small pack, but still has the separate zipped out compartment for my shoes and work clothes when riding to work and I use it for wet sweaty stuff when I use the pack as my hiking pack. Overall, highly recommended! I had been looking for just the right size day hiking pack for the last year and I finally found it. This day pack fits my short torso and the adjustable straps allow me to fit it to my frame. It holds all my gear and flower books with easy access from the top and back. I highly recommend it. The first thing I liked about the Deuter Backpacks line is the simplicity of the packs they make. 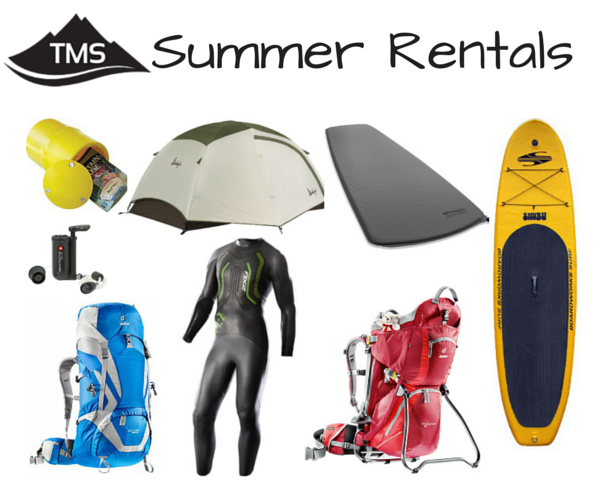 It is easy to get tangled in all the straps and accessories that sometimes come on a pack. 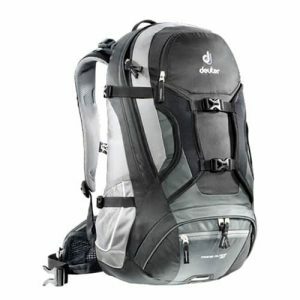 Deuter attempts to keep their packs to the important parts, like fit, functionality and carrying ability. This makes it easy to use the pack, and they have great prices! The 65-liter size of this pack (75 L if you extend the top) was perfect for the overkill over-nighter I took it on. In addition to the stove, fuel, water, food, a big sleeping bag and sleeping pad, I also packed an excessive amount clothing, a Nemo two-person tent, a Platypus water filter, cookware, and not to mention a three-liter bag of wine and two acrylic wine glasses. Hey, I had to find more weight somewhere to properly test the 65+10 on those long, grueling 40 — er, I mean, 4 — miles to Downey Lake in Tahoe National Forest. The pack ended up weighing about 40 pounds, and it carried the load very well ­— much more comfortably than my current backpack. Deuter does not use a Small-Medium-Large sizing system. The backpacking packs have adjustable shoulder straps, allowing them to fit just about anyone. It makes for a great pack to loan out to a friend (thanks to Dave for lending me his for this review), and they work well for teens who are still growing. I can testify to the ease of this system. I had to make an adjustment on the fly while hiking. It took me 10 seconds to move the straps up a notch. 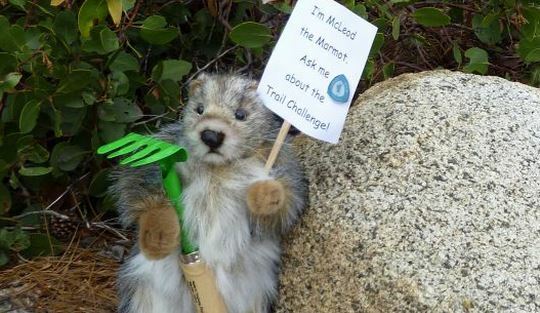 I’m sure that Dave will appreciate this, too, when he notices, on the trail, that his pack has been messed with. There’s not a lot more to be said here. The ACT Lite 65+10 is easy to review. I like it. A lot. The clean, straightforward character of this backpack is really why it shines. I backpacked through Japan with this product. It had an amazing amount of storage space for not being such a huge bag, and the travel bag turned out being tremendously useful. The bag was also not too large for travel on the trains in Japan which can be very crowded. I could minimize my impact on space to the point where I was not a burden to those around me. Overall I rate this bag excellently, it has a lot of storage and it has adequate ventilation and the travel bag is a nice bonus. Previous PostRaging Russian Rivers and Grizzly Bears: The Kamchatka Project Next PostTahoe Rim Trail Thru-Hike in 5 Days?